When a garden is designed, the advice is to start with Winter and think about the features that will provide a display. Dogwoods are favoured for their striking naked stems and Viburnums (tinus and bodnantense), Mahonias and Ericas for their flowers. Bulbs tend to be thought about, not so much in the planning stage of a garden, but rather as the autumn and winter months approach. There is a panic about colour and the potential lack of it during the dark cold months ahead. It cannot be denied that bulbs, these fascinating specimens of self-sufficiency, will provide a solution, be it as a woodland carpet, upright flowering stems in formal borders, in alpine gardens, outdoor pots, indoor displays or as cut flowers. 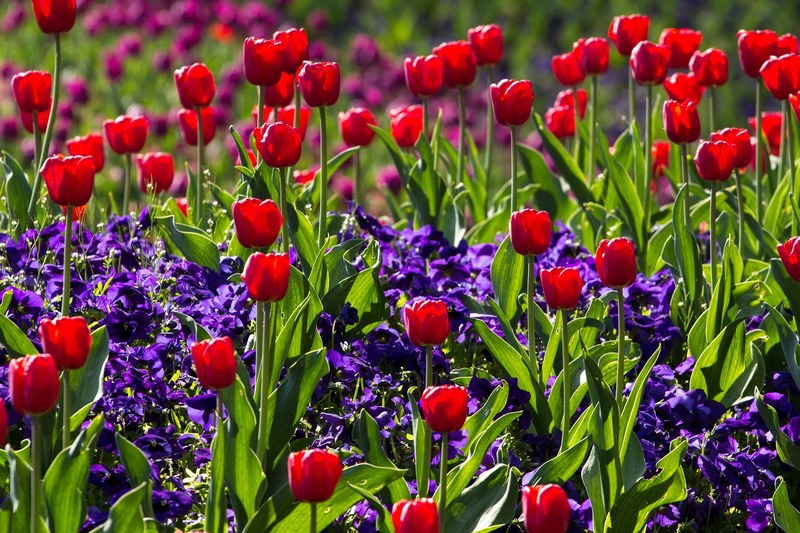 For simplicity, gardeners tend to refer collectively to corms, tubers and bulbs as “bulbs”. They are the prime example of vegetative reproduction, essentially growing a new plant from some part of an old plant. The other horticultural term of great significance in the case of bulbs is perennation – the ability to store food and survive from it over Winter. These are the original energy-saving bulbs. The fat bit around the base of a bulb is the compact stem, and the fleshy scales that it supports that enclose the reproductive parts are the leaves. It is within the leaves that the food (in the form of starch) is stored for overwintering. Bulbs come in a variety of shapes and sizes. 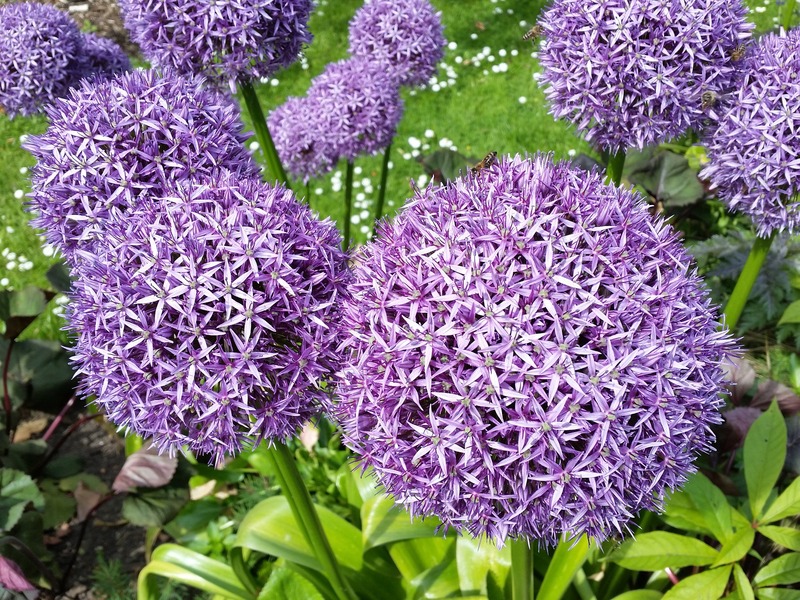 Alliums are very large, providing a clear indication of their close relationship with onions. Daffodils (narcissi) are almost as big, Hyacinths and Tulips are a little less mighty, and crocuses, snowdrops and cyclamen can all be planted as smaller forms. Be sure to plant cyclamen bulbs the right way up, as it can be difficult to the inexperienced eye! When selecting bulbs, ensure your selection provides something of a display throughout the seasons. Bulbs should be firm and healthy-looking, with no cuts to the surface. If any stems are visible at the top they should be short and thick, otherwise it is too late to plant them for a strong stem to emerge. Ideally buy then when you are ready to plant. Store them for no more than a week (two at the absolute most) in a cool, airy, frost-free position that is not in direct sunlight. Remember that some bulbs are not mature or strong enough to flower in their first year so be patient with your selection. There are two exceptions to mention. Snowdrops and Cyclamen dry out quickly as bulbs. Ideally purchase snowdrops after they have flowered, when they still have foliage. The cyclamens should be in pots. In terms of flowering period, the obvious choice for Winter is the snowdrop (Galanthus). You should also consider Chionodoxa luciliae which is a low-growing, prolific seeder that is a good competitor against most weeds and can provide a glorious carpet of starry white and blue blossom given the right conditions. Associated with Spring are daffodils, and there are dozens and dozens of varieties. There are double-flowered kinds such as ‘Irene Copeland’ and if you like daffodils with yellow and white flowerheads, the butterfly-shaped centres of ‘Love Call’ and ‘Tricolet’ are a joy. There are daffodils that will flower later, providing a display through to the summer. Crocuses and tulips are the other staples. Crocus chrysanthus provides a variety of colours and many start to flower earlier than spring. Tulipa clusianna provides a beautiful contrast of pink and white. Irises and alliums are the more common Summer-flowering bulbs, and Allium giganteum can be really impressive in a mixed border, providing height and structure. The seed-heads dry well for indoor displays. If you are clever with your selection, you will have bulbs flowering in Autumn, when most others are only thinking about what to purchase for the Winter. Colchicum, confused frequently with autumn crocuses, are referred to as naked ladies because they produce their flowers before their foliage. Colchicum speciosum is the most widely found in gardens, predominantly the lilac-flowered variety. My favourite at this time of year is Nerine bowdenii. I couldn’t write about bulbs without mentioning fritillaries. They require a little extra care when planting, but they are worth the effort. The bulb scales are damaged if exposed for too long and they should be planted with a layer of grit underneath them so the bulb base does not become soggy, but Fritillaria meleagris (snakeshead lily) is one of the most delicate, pretty-looking flowers of late-spring/early-summer. They aren’t as impressive as a mixed selection, so try groups on their own. Selections could include ‘Charon’ (deep-purple), ‘Aphrodite’ (white) and ‘Poseidon’ (soft-rose purple). As with and kind of planting preparation, make sure your soil conditions are suitable. Bulbs like well-drained, humus-rich soil so if you do not have that, then improve it. It’s important to plant bulbs at the right depth so follow the planting instructions closely. If you do not have them to hand, you won’t go far wrong if you plant each bulb at least twice the depth of its size and space them about twice their width apart. Push the base of the bulb into the soil so that the roots make contact. I first heard the advice of scattering bulbs that are to be naturalised from watching Monty Don. He advised that you plant them where they fall, and I wouldn’t argue with that. Bulbs are not always planted underground. Cyclamens are a good example of this. Once the bulbs have finished flowering, give them a foliar feed and leave the foliage to die back naturally. When the leaf swords turn yellowish-brown, the leaves have finished photosynthesising to feed the bulb for the following year and if you don’t cut the foliage back then you are asking the bulb to carry on working when it should be resting. You are then sacrificing the quality of next year’s flower. Recently on Gardener’s World, I watched Monty Don scrub away the small bit of foliage left visible above ground after he had cut back the main leaf blades. He said the remaining bit of visible foliage could provide a nesting bed for grubs. It seems sensible to follow his advice. Do not tie up the foliage. If you do, then not enough leaf blade is showing for sufficient photosynthesis activity to occur. Remember that nature has a way of working these things out by itself. September is the best time to prepare a display of indoor bulbs, ready to flower for Christmas. Crocuses, hyacinths and daffodils can all be planted in a shallow bowl of bulb fibre. Water the fibre and wrap the bowl in newspaper and place it in a cool, dark, airy space until November/December. Hyacinths will grow in just water if you purchase a hyacinth vase, but make sure the bottom of the bulb stays dry or it will rot. If you have planted cyclamens outdoors in pots, they can be brought back inside. Poinsettias need 14 hours of darkness to produce their flower buds, so find them a special place to rest. 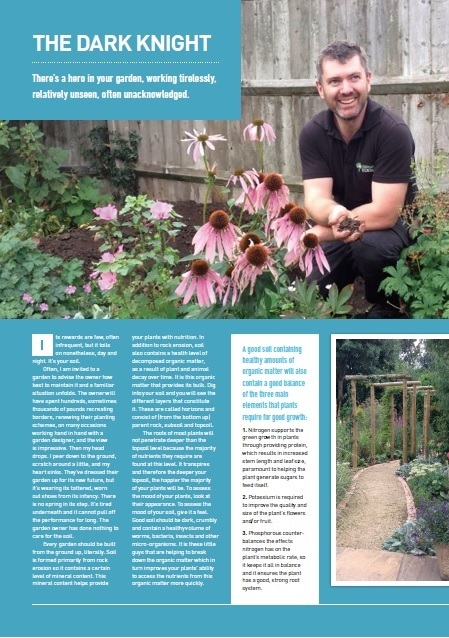 Oxford Edens is a gardening business based in Oxfordshire, specialising in garden development and maintenance of both domestic gardens and commercial grounds. We are registered with the Environment Agency as a business that produces composts in an environmentally manner, recycling wherever possible. There’s a hero in your garden, working tirelessly, relatively unseen, often unacknowledged. Its rewards are few, often infrequent, but it toils on nonetheless, day and night. It’s your soil. Often, I am invited to a garden to advise the owner how best to maintain it and a familiar situation unfolds. The owner will have spent hundreds, sometimes thousands of pounds recreating borders, renewing their planting schemes, on many occasions working hand in hand with a garden designer, and the view is impressive. Then my head drops. I peer down to the ground, scratch around a little, and my heart sinks. They’ve dressed their garden up for its new future, but it’s wearing its tattered, worn out shoes from its infancy. There is no spring in its step. It’s tired underneath and it cannot pull off the performance for long. The garden owner has done nothing to care for the soil. Every garden should be built from the ground up, literally. Soil is formed primarily from rock erosion so it contains a certain level of mineral content. This mineral content helps provide your plants with nutrition. In addition to rock erosion, soil also contains a health level of decomposed organic matter, as a result of plant and animal decay over time. It is this organic matter that provides its bulk. Dig into your soil and you will see the different layers that constitute it. These are called horizons and consist of (from the bottom up) parent rock, subsoil and topsoil. The roots of most plants will not penetrate deeper than the topsoil level because the majority of nutrients they require are found at this level. It transpires therefore that the deeper your topsoil, the happier the majority of your plants will be. To assess the mood of your plants, look at their appearance. To assess the mood of your soil, give it a feel. Good soil should be dark, crumbly and contain a healthy volume of worms, bacteria, insects and other micro-organisms. It is these little guys that are helping to break down the organic matter which in turn improves your plants’ ability to access the nutrients from this organic matter more quickly. (1) Nitrogen supports the green growth in plants through providing protein, which results in increased stem length and leaf size, paramount to helping the plant generate sugars to fed itself. (2) Potassium is required to improve the quality and size of the plants flowers and/or fruit. (3) Phosphorous counter-balances the effects nitrogen has on the plant’s metabolic rate, so it keeps it all in balance and it ensures the plant has a good, strong root system. However, the problem lies here. These elements are leached out of your soil on a continuous basis through rain or lost by being consumed by plants. Only a minority of people ever consider that they should be replacing these elements by feeding their soil. You can do this two ways. The first is a short-term fix, through using inorganic fertilisers such as tomato feed, seaweed solution, or even the amateur gardener’s favourite tonic, MiracleGro. However, this really is only a very short term fix as these solutions do nothing for your soil’s structure, so they too can be leached out through your soil. The answer is soil conditioner. Soil conditioner is, in essence, organic matter. At Oxford Edens, the conditioner that we supply most of, consists of many ingredients, but predominantly rotted down leaves, grass clippings and manure and it will ensure your soil’s structure is improved (improving air and water flow), its mineral content is enhanced and your depth of topsoil increases over time. Whether you have a sandy soil which retains nutrients poorly and needs to be bulked out and nutritionally enhance, a clay soil that compacted and draining poorly and needs better structure for air flow, or a chalk soil that is too shallow (as they often are), you need to improve your soil, ideally in the autumn/winter (dependent upon soil type) and spring. Neglect this at your peril. Your garden will not thank you for it and your dark knight will be visible, in the form of a shrinking violet. Lawns fascinate me. They provide a backdrop to the combustion of colour that Summer brings, and in many gardens, they become the feature of the garden in Winter as herbaceous growth has been cut back and many trees have lost their foliage. They also appear to be a man’s domain. If I’m invited to look at a potential client’s garden, the borders are discussed in detail, concerns about trees are alluded to and all the while we dance around the large green feature underneath our feet without a mention of it. When I enquire as to whether they would like me to maintain the lawn, they inform me that “my husband does that”. Therein lies the problem, perhaps? I am a man. By nature, we like instant, we like immediate cause and effect, we don’t play the long game very well. Like anything in your garden, a lawn needs nurturing. Many don’t have the time while others feel intimidated by undertaking some of the tasks alone. In reality, improving your lawn can be simple because few people go through the routines described below. Those that do, are the envy of their neighbours. To start with, let’s consider what a lawn is. What makes up a lawn? There are, essentially, three types of garden lawn (discounting meadows and non-grass lawns) and all are made up of a mix of grass types. Firstly, there is the “Wimbledon” lawn, a first-rate luxury blend of Bents and Fescues. These are fine-leaved grasses that require very frequent maintenance and do not stand up well to heavy foot traffic. Consider the appearance of Centre Court after dry weather and five days of play, and that is with the most thorough of maintenance programmes. If you want a luxury lawn, you pay a premium in seed or turf costs and your base must be spirit-level flat before laying it, otherwise the effect is compromised and maintenance becomes problematic. Typical grass types that constitute this type of lawn are Agrostis tenuis (Browntop Bent) and Festuca longifolia (Hard Fescue). If you are hell-bent on having a luxury lawn, ensure that your soil will support it. It needs good drainage so a clay-base is far from ideal. Most of us will require a lawn to withstand traffic. The constant padding down of paws or trampling around of little people can be wearing on the leaf growth and can cause compaction. The best mix of grass types to constitute a utility lawn are those that do not require the frequent intervention that a luxury lawn does, are relatively forgiving if the lawn is cut with slightly worn blades or poor technique and can recover quickly. Perennial ryegrasses are chosen for toughness and broad-leaved meadow grasses seed well to provide a constant density of green. Poa pratensis (a smooth-stalked meadow grass) copes well in dry Summers and Poa annua is a broad-leaf grass that will colonise bare patches in no time. Add in perennial ryegrasses such as Manhattan or Hunter which recover well from being mown too short, and Lesser Timothy which copes admirably in heavy wet soils, and you will have a carpet of resistance that also looks impressive if cared for properly. Unfortunately, utility lawns can turn into second-rate lawns if their maintenance programme consists of infrequent mowing and a lack of feeding, weeding and watering. They can be recovered but the time required is significant. Prevention is infinitely better than cure. Grasses are tough competitors. If you maintain a good density of grass within your lawn, weeds will find it difficult to survive. Your maintenance programme can be straight-forward, but it should be an all year round approach and be followed with consistency. Start by raking any remaining leaves or other unwanted obstacles off the lawn, and test to see if the lawn is compacted. Compaction is when the surface of your lawn is not particularly porous, meaning that air cannot circulate fully around the roots below and their vigour is affected. If you cannot push a matchstick into the lawn with one finger, it is compacted. To relieve this, push a fork at least 3 inches into the lawn and do this across the whole surface. You will know you’ve done it afterwards because the blisters on your hands will remind you for days. No pain, no gain. If you have problems with moss (which generally results from shade or compaction, because in both cases water sits on the surface of the lawn which provides the ideal condition for moss to spread) then apply a lawn sand to kill it. You can then remove the moss, top-dress the lawn and over-seed the bare patches. The other important tasks are the breaking-up of creeping weed stems and the removal of thatch (dead grass) by raking with a spring-tine rake. Thatch can encourage moss to develop as it provides a good surface for water to sit on. Once that is done, feed the lawn with a nitrogen-rich fertiliser because that will aid the green-growth throughout the growing season. Weed-killers can be applied if the lawn is weedy. Make sure you select the right product for the type of weeds that you have. I generally avoid the all-in-one products. My experience of them has not been great. Late spring is the best time to apply them, particularly if the weed-killers are systemic and require the weeds to be in full swing to penetrate all the way down the plant. You should mow the lawn weekly if the grass is vigorous because fortnightly will mean that the lawn is losing too much leaf blade in one swoop, which can shock it. If you do want to roll the lawn to level it, now is the time to do it. Summer is straightforward. Mow regularly, leaving about an inch of growth above the surface. This is ideal for the vigour of the grass and production of side-shoots to thicken up the lawn, thus helping it fight off competition from weeds. Clippings should be collected and composted. Keep the lawn nice and moist. If it dries out then the leaf blades and roots become stressed. The lawn should be spiked (lightly aerated) and scarified to remove thatch. If moss is a problem, then apply a moss-killer before scarifying. Top-dressing your lawn with a mix of loam and sand will improve the evenness of the surface of the lawn and will improve the vigour of the grass in the spring because you are alleviating the likelihood of problems such as compaction (the sand in the dressing helps drainage and you are improving the depth of the ideal topsoil level) and encouraging more side-shoots to form in the spring. The fertiliser you apply in autumn is more balanced in its make-up of nitrogen, potassium and phosphorous than the one in the spring which was nitrogen-dominant. If you use that in the autumn you would encourage top-growth which exposes new growth to harsh winds, wet and cold weather and this can damage the lawn. The fertiliser in the autumn is more about strengthening root development as well as leaf-blade strength for the new season. Ensure that any leaf-fall is removed from the lawn as this will provide shade and encourage moisture to sit, and moss problems can result. Now is a good time to edge the lawn. [Box item] Never mow in cold strong winds as the leaf blades will be wind-scorched and remain visibly damaged until the new growing season. Now is the time to keep off the lawn for fear of causing damage. If the day is dry and the surface is not wet or frozen, then keep removing leaves from the surface. Maintenance of your lawn can seem a little time-consuming as the result is not as instant as spending a day in your borders, but over time you will reap the benefits. Today’s efforts are tomorrow’s routine and your lawn could become your man’s best friend. Oxford Edens is a gardening business based in North Oxfordshire, specialising in garden maintenance and we would be delighted to discuss your garden or lawn maintenance requirements. Please contact Gavin on 07717 495215 or email gavin@oxfordedens.co.uk. The complexity of the rose’s history is in stark contrast with the simplicity of its beauty. It’s rare to find an English garden without one, and perhaps the most obvious reasons for that are the variety and reliability of them, given the right situation. To understand where the variety has developed from requires a little bit of delving into its history. Gavin Power of Oxford Edens does just that. Roses pre-date the human race by several thousand years, but the most significant periods for the English gardener to consider are the twelfth and thirteenth centuries, when crusaders introduced roses to European monasteries, upon their return from the Holy Land. These Gallica, Damask and Alba roses were prized predominantly for their medicinal powers, but their beauty was understood and soon the process of hybridisation began, as monks sought to introduce new varieties from seedlings. This man-made intervention carried through the centuries, with gardeners and nurserymen, largely in France, creating ever-increasing varieties. Driving this development of hybridised roses, were the perceived limitations of Old roses. Old roses refer to naturally occurring wild and species roses that are highly fragrant (and no two scents are the same), limited in colour to pinks, creams, whites, mauves and purples and tend to be shrubby with a single flush. The desire to introduce new colours to the rose and encourage repeat-flowering resulted in the production of the two biggest groups of modern-day New roses, the Hybrid Teas and the Floribundas. However, many of the early hybridised roses were poorly scented, and in 1969 this issue was addressed by David Austin, when he commenced his development of English Roses in his Shropshire nurseries. The aim was to create New roses that had all the valued features on Old roses, particularly the fragrance, but also utilised the strengths of the Hybrid Teas and Floribundas, specifically the spectacular colours and ability to flower repeatedly. Whatever size of plot you have, even if it’s a simple window box, there will be a rose for you. The most popular are shrub and bush roses, whilst many have ramblers growing up old apple trees or climbers that ascend and arch over pergolas. Others have wild roses grown as impenetrable hedges for security, and an increasing number of patio roses are now sold in garden centres. One of my favourites is the groundcover rose which requires little attention and provides good competition for weeds. Bush roses are either Hybrid Teas or Floribundas and although both tend to be medium height in size (40 to 100cm), they have quite differing characteristics. Hybrid Teas are highly fragrant with one flower per stem and they flower in flushes. Floribundas are more bushy and flower continuously, and the flowers are less striking but they do grow in clusters so give a mass of colour. Growing to a height of up to 4 metres, shrub roses are much larger specimens than bush roses, and can be recurrent flowerers or non-recurrent, but all are very hardy and reliable. One of the most spectacular of the repeat flowering is ‘Westerland’, a large and very fragrant yellowish-orange rose that I would highly recommend. The distinct difference between climbers and ramblers is the flowering characteristic. Climbers will stretch to about 4 metres in height and have much more rigid stems than ramblers, and they will flower repeatedly. In contrast, ramblers only flower once in a season, but will get to a height of around 6 metres and can be trained like a contortionist. Repeat flowerers, these tend to stay at around 30 centimetres tall and have small leaves and flowers that are pretty in form. ‘Sweet Magic’ is an orange and gold variety that rarely disappoints. The size range of these is considerable, with lower growing prostrate varieties such as ‘Snow Carpet’ getting no higher than around 15 centimetres but more bushy varieties such as ‘Moje Hammarberg’ will sit around 80cm tall and perform the dual task of providing groundcover and offering an attractive flowering hedge. The broadest classification is this group as it refers to the Hybrid Teas, the Floribundas, patio and miniature roses and ramblers that are budded on to rootstocks that are up to 140cm tall. Weeping standards such as ‘Dorothy Perkins’ with its rose pink umbrella shape can be spectacular. Most roses in domestic settings are purchased as potted roses and can be planted out at any time of the year, avoiding periods of frost of course. However, bare-root roses are a little more specific in their requirements and should only really be planted in the Autumn before any frost appears. This gives them times to get their roots settled in and in good health for spring. It also allows the woody content of the plant to stay nice and ripe as there is sufficient moisture in the ground over winter. Before planting bare root roses, leave them for 24 hours in water, water them at the budding union, and then water them again when they are planted. The plant should then be watered heavily every five days until the first shoots appear. 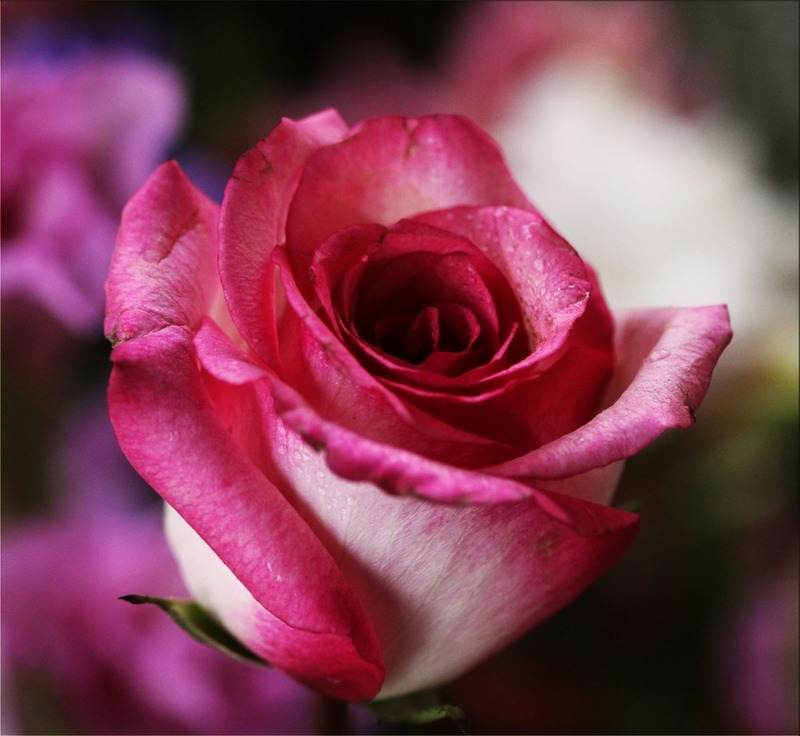 Roses require a phenomenal amount of water, primarily because they are supporting a huge number of flowering parts. By watering them to the required extent, you will enhance the flowering and help stave off disease. During the spring and summer months you should be watering the base of roses so that the roots receive about 20 litres per square metre of plant. Avoid watering the leaves as that can encourage fungal diseases. Roses should also be mulched with rotted down manure or organic matter, and this should be done in the spring and autumn. However, there is the opinion amongst gardeners that fragrant roses do not like too much of a manure diet, so go steady. The good news for many gardeners in Oxfordshire is that roses do prefer heavier soils! Bare-root planting is carried out in the spring which is also when the pruning of roses should be undertaken. In Liverpool, gardeners traditionally plant and prune the Sunday after the Grand National whilst in County Cork these tasks are usually carried out on St. Patrick’s Day! Roses that flower once, such as Old roses and wild roses should be pruned as soon as they have gone over and the pruning should be minimal as these roses flower on old wood. All cuts should have a slight angle to avoid standing water on the stem causing it to rot, and cuts should be made one centimetre above a bud. Aside from pruning out dead, damaged and diseased wood, the only other pruning that is required is a thinning out of the plant, and perhaps every five years or so to undertake renovative pruning by cutting the oldest stems down to the ground. The hips, which are the false fruits that contain the real fruits, can be left for the birds to help them survive the winter, but they can also be a feature in themselves. Rosa sericea pteracsantha has striking red hips on yellow stems. Finally, standard roses should generally have the stems pruned back by two-thirds, and the same for miniature roses (unless they are planted as edging plants and then you can shear them to half their height). Ramblers grow vertical shoots on last year’s horizontal stems and these verticals should be pruned back to between 2 and 5 buds from the stem base. Old wood can be pruned down to the ground to rejuvenate it. Climbers can be pruned very hard to renew them, so be brave if you need to be. Like all garden maintenance tasks, if you set yourself a routine to follow you won’t go far wrong. Failing that, get a professional in. I know a blooming good one. 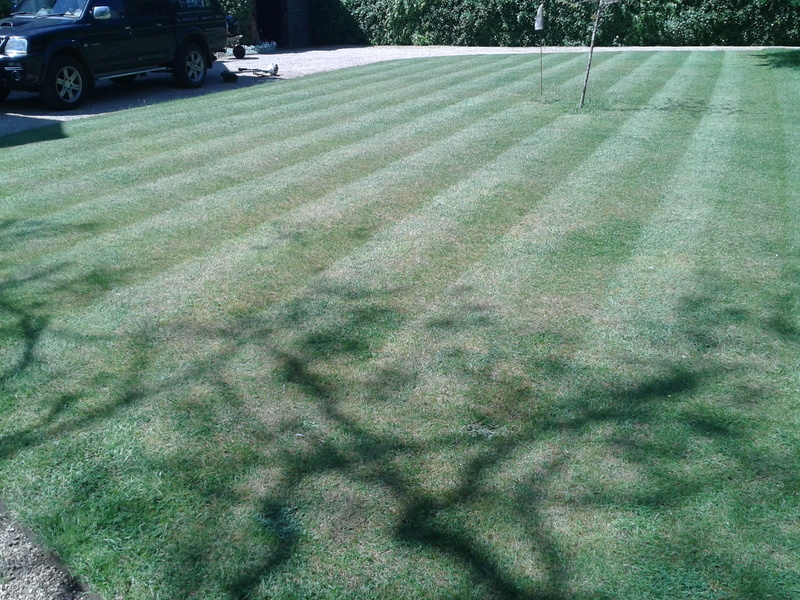 Oxford Edens is a gardening business based in North Oxfordshire, specialising in garden maintenance. We would be delighted to discuss your garden requirements. Please contact Gavin on 07717 495215 or email gavin@oxfordedens.co.uk.